We are catholic wedding photographers based in Saint Paul, Minnesota. Our own love story started when we met studying abroad in Rome and now our heart is centered on capturing the love stories of other young couples becoming husband and wife. Congratulations on getting engaged!! We’re thrilled for the two of you to becoming one in a matter of months. Seriously, it will fly by faster than you know! As photographers and newlyweds ourselves, there is a lot we learned in the process that we’re excited to share with you so that you can find the right fit for your wedding day! You can narrow in on your search for a wedding photographer when you know your vision for the wedding day and can match it with a photographer who shares the style, personality, and budget you are looking for. This also ensures you will have the BEST experience with them from the start. Do you like their photo style? First, you are going to look at these images for a lifetime. It can help to know what characteristics of editing styles that you’re naturally attracted to. Do you like when photographs are bright, vibrant, soft pastels, dark and moody, artistic, dramatic, etc.? You may l-o-v-e a particular photographer personally, but if you don’t like their editing style, you may not love your images the same way for a lifetime. Do your personalities match up? Next, decide how involved you want the photographer to be on the wedding day. 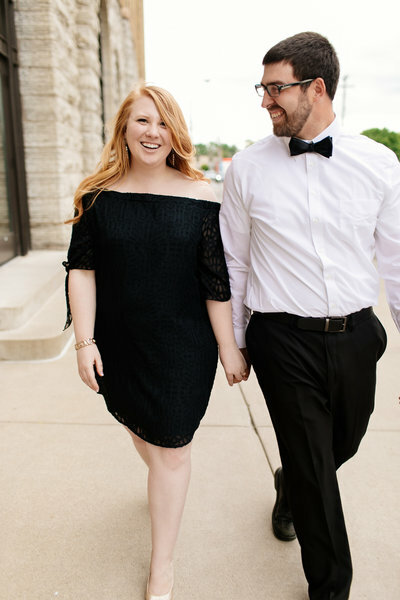 Other than your soon-to-be spouse, the photographer is only other person who is with you so intimately throughout the entire wedding day from the getting ready suite to the reception. You will want to make sure that you are comfortable with having them with you through it all and trusting them to make judgment calls on lighting and location as the day unfolds. Are you looking for a photographer who is more laid back and comes in to document the day as it is (the way an observing photojournalist would) or do you want someone who comes in to style your details and coaches you into poses to make your day feel like its own magazine spread? Maybe you want a healthy mix in the middle of candids and posed images – some moments interactive and some discreet. If faith is important to you, you should consider choosing a photographer who shares the same faith or at least specializes in church weddings so that you can rest assured they will be reverent during the ceremony and keep their eye out for those special moments that are sacramentally important beyond the vows. As Catholic photographers, we always aim to capture the elevation of the Eucharist, offering of flowers to Mary, and your first time receiving communion as newlyweds because we know how significant these intimate moments are within the Catholic tradition. Knowing all of this ahead of time helps set the right expectations with who you’ll choose. You can narrow the list by setting up an in-person consultant to help you gauge if they have that Goldilocks effect of being just right. Are you comfortable making the investment? Photography is an investment, but it reflects the deep personal investment of the couples who are committing themselves to a life-giving relationship. There is no doubt a litany of expenses when it comes to planning a wedding, but photography is one of the very few things that remains when the day is done. As time passes and you look back on your wedding photos, it is more than an image, it is also a sign of your sacramental vow that you’ll be fighting for and celebrating in the decades to come. These will be your first family heirlooms, your legacy upon the walls next to the generations of love before you and after you. When you know your vision and how photography is prioritized for you, then you can approach the money conversation with photographers from a more stable, objective place. It likely costs more than you expect due to the time invested by the photographer beyond just the wedding day itself to edit the images, the behind the scenes cost of running a business, the types of services they offer, the photographer’s expertise, and varies if they rely on this income to support their family. If you can articulate what you’re looking for, then you will walk away with the parts of the day captured that mattered most to your vision and that match your desired style. It is always worth making the stretch to fit your photographer into your budget, but to do so in a way that will bring you joy and peace at the end of the day. Drastically overspending can place a negative emotion on your decision which overflows onto the images themselves. Be sure you’re excited to invest with your photographer whether they were in your original budget or if you are making a special splurge. We hope you found this helpful in providing some criteria for your search. At the end of the day, you’re growing together as a couple as you work through making big decisions and memories together. Cherish this exciting season of engagement and remember through it all to plan for a marriage more beautiful than your wedding day. What’s it like having Katzie and Ben with you on your wedding day? If you’d like to learn about what our wedding photography experience is like, we’d love to send you more information and setup a coffee double-date to hear more about your vision for your wedding day. Simply fill out our contact form and we’ll be in touch soon!